Synopsis: What if love refused to die? 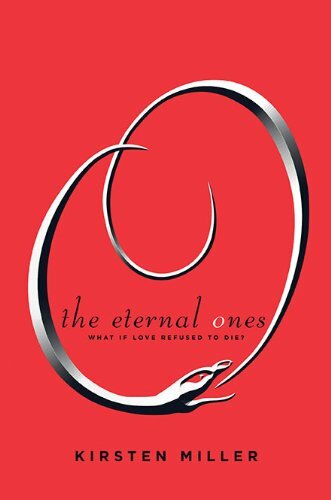 Thoughts: The Eternal Ones is a beautifully written novel about past lives, reincarnation and undying love. While the story is very similar to other current YA novels (*ahem* Evermore), I still found it captivating and lovely. For as long as Haven can remember, she's had visions of another life and a boy she believes is her soulmate. Unfortunately, Haven lives in a small southern Tennessee town where different is considered devilish. When she was a child, Haven used to share her visions with her classmates and family. The whole town is convinced she's crazy or worse, possessed by a Demon. With the strict lifestyles as a Southern Baptist, Haven begins blocking out these memories the best she can. Now in her teen years, Haven realizes she'll never fit in. At least she has Beau, her BFF and fellow outcast. One day, while watching tv, she notices a boy and realizes he's her soulmate. It's Ethan, the one from her visions. After much thought, Haven decides to head up to NYC and find him. No longer Ethan and now Iain Morrow (rich, famous and scandelous), it doesn't take long for Haven to find him. He recognizes her right away and they soon drift off into the perfect love affair. The honeymoon period doesn't last long. Now there are other things out to get her. For example, the Ouroboros Society isn't the safe house it once was. With all their secrets and Iain's secrets, Haven soon begins puzzling the pieces into her past lives, her present and her future. *Iain (aka Ethan) remembers everything whereas Haven only remembers bits and pieces. In Evermore, Damon remembers everything and Ever remembers nothing. Sure Damon never dies, but still. *Haven and Ever's BFFs are gay guys. *Haven and Ever get lost in the love affair, but then begin to question their guys. They both believe their guys are killers. *Haven and Ever are both quick to judge and both a little pig headed. They would rather believe strangers than their family, friends and lovers. *In each life, Iain and Damon search for the girls. *The snake symbol and secret clubs designed for their kind. Honestly, I could add more, but I think you get the point. When writing novels with similiar backgrounds, it's difficult to not make it mirror others of it's kind. I remember reading The Eternal Ones and thinking "Wow, Iain is just like Damon and Haven is just like Ever." I think it's important for the characters to establish a uniqueness which makes them stand out above the rest. Unfortunately, in this case, they were just TOO much alike. Even Beau reminded me of Miles. With all that said, there are things I did enjoy about The Eternal Ones. I loved how all the past experiences were relived. I loved Iain and his protective nature. He's such a sweetheart and very swoon-worthy. Beau's humor kept the story interesting and fun. In my opinion, the writing was more elegant than that of Evermore's. And of course, the drama. Got to love the drama. At times, the pacing can be a bit slow, but if you love a good romantic read, I would recommend checking this book out. Sounds good, even with its similarities to Evermore. I will def. be checking this one out! :) Thanks for the great review! @Sherry- I luff you. Just wanted to let you know. Hmm I was sort of interested in reading this but now I think I won't read it (unless I get it for free), wasn't a fan of Evermore so I probably won't be a fan of this. Great review! And I agree with Karen it reminded me of Fallen and that was another one I didn't like :P. I think I don't like YA fantasies with too much romance xD.